This event slipped past me completely. At the beginning of August, Reena's other band, al Khemia, played an early show at Madison's popular High Noon Saloon. They opened for another local band, Patchwork Monkey. 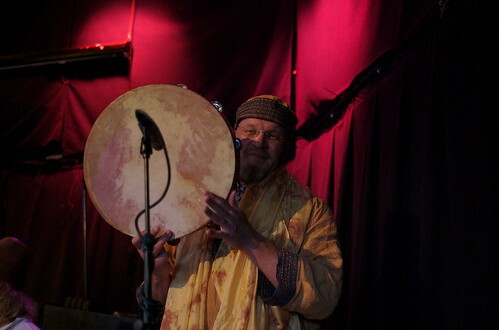 Al Khemia plays a melange of Arabic music, mostly classics. Joining them on stage for this performance was talented local belly dance instructor Mona N'wal. It was a pretty good show, and the audience seemed appreciative. It bears mentioning that members of al Khemia also play in other bands: Reena and Marko play with Pagee Go Go, and Alec and Rebecca play with Patchwork Monkey. Bill plays on demand for Mona's dance classes. You can view photos on my Flickr site via this full-size SLIDE SHOW, or you can view them right here in a smaller format.